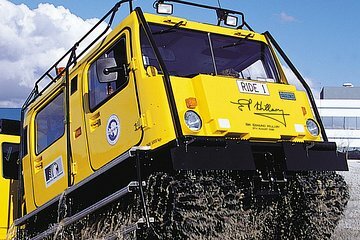 This guided tour from Christchurch includes a Hagglund snowmobile ride at the International Antarctic Centre and a dinner buffet at the Willowbank Wildlife Reserve. Start with the Snow and Ice Experience and watch the antics of playful arctic birds at the Penguin Encounter, then observe both native and exotic animals — including the endangered kiwi bird — at the wildlife reserve after your five-course meal. Round-trip hotel transport is included. Das International Antarctic Centre, das mit dem Tourism Award des New Zealand Tourism Board für die beste Besucherattraktion ausgezeichnet wurde, bietet ein interaktives Erlebnis, das das Gelände und die Wetterbedingungen der Antarktis nachstellt. Das Willowbank Wildlife Reserve zeigt eine Vielzahl von Tieren, die in Neuseeland heimisch sind und in Neuseeland eingeführt wurden. Nach dem Transport von Ihrem Hotel in Christchurch am Nachmittag nutzen Sie Ihre Eintrittskarte für die Snow and Ice Experience und tauchen ein in ein Bild des südlichsten Kontinents. Nach dem Kampf gegen arktische Winde und Blizzard-Bedingungen besuchen Sie die Pinguin-Begegnung, um blaue Pinguine zu beobachten - die kleinsten der Welt. Verpassen Sie nicht eine 20-minütige Fahrt mit dem Geländewagen von Hagglund. Ihre Tour führt Sie weiter zum Willowbank Wildlife Reserve, wo Sie nach der Freizeit ein neuseeländisches 5-Gänge-Büffet-Menü erhalten, um den Hof und den Zoo zu erkunden. Nach dem Essen können Sie das Wildnisreservat besichtigen, um Kiwis in ihrem natürlichen Lebensraum zu sehen. Lernen Sie Neuseelands Nationalvogel kennen und beobachten Sie Keas, Possums, Wallabies, Kapuzineraffen, asiatische Otter, Siamang-Gibbons, Katta und vieles mehr. Ihre Tour endet mit der Rückkehr zu Ihrer Unterkunft in Christchurch am Abend. Bitte beachten Sie: Pro Buchung sind mindestens 2 Personen erforderlich. Interesting exhibits, with penguin feeding and commentary especially enjoyed. Ride on Hagglund altogether too wild for over 70's like ourselves - threw us around too violently to be appreciated. Wildlife Centre guided visit to native bird section was enthralling, close proximity to native and rare birds a real privilege.Dinner at the Casino was lovely. The Antarctic Centre and Willowbank Wildlife Centre are both great sights, but this tour was unfortunately somewhat disappointing. While we arrived at the Antarctic Centre before the 3pm departure time stated on the website, we barely had an hour there, missing out on some of the key attractions, before having to depart for the Wildlife Centre. The tour at the Wildlife centre began at 4:30pm for an hour, by which time the Reserve had closed (winter hours), and our driver was ready us rush off to the dinner destination. Dinner was fine, although in keeping with the rest of the tour, rather hurried. Again we were only allotted about an hour, and had only just got our mains when our driver returned to take us back to our hotel. Even though we would have made it back to our accommodation well before the 8:30pm finish time, only a small extension was offered, as the driver had another job to attend. We decided to make alternative arrangements. This tour had a lot of potential, but perhaps the description needs updating, or additional information to let people that activities in the winter or off season (if that was the reason) are different to those stated. For example, the dinner wasn’t at the Wildlife Reserve, as described on the website. If you have very limited time in Christchurch, this tour might be worth considering. However, if you’re less restricted, neither of the sights are too difficult to get to on your own and there’s a free shuttle to the Antarctic Centre from the center of town. the tour was ok as I was with teenager children. But the city is still not alive because of earthquake. So my group was me and my children only. The Antarctic Centre is alot of fun for kids and has some very interesting information for adults. We enjoyed the penguins, the Ice Storm room and reading about life in the Antarctic. The Haggalund is definitely worth doing. Willowbank was ok but wouldn't rave about it. We did get to see our first KIwi though. We had a bit of spare time before dinner so our driver took us on a little tour of the city and showed us some of the devastation caused by the Earthquake which we wouldn't have seen otherwise. We had dinner at the Casino which was really nice. Though the earthquake closed the Antartic Center, the tour operator did a great job of providing alternative arrangements. Our driver, Ross, was outstanding -- friendly and personable. Great trip. Was ideal time as we flew in late night before was perfect timing, pick up in afternoon as it gave us the morning to get ourselves together and have a lazy morning. A quick look around, get our bearings before we started on the serious stuff. The driver was great and very helpful. We had a wonderful time. The Antarctic Centre was very informative. The Blizzard Room was great - if you closed your eyes you certainly felt as though you were at the South Pole in the middle of a blizzard with temperature of minus 18 Celsius! We then travelled to the Willowbank Wildlife Reserve for a meal and escorted tour of the Reserve. The meal was excellent, promptly served, and the guided evening tour was great. Our guide was very knowledgeable, and I would definitely recommend Willowbank as an outing - particularly the range of wildlife on display including a nocturnal house that displayed the kiwi. Great fun. The entire excursion was well organised; all staff at both locations were friendly and helpful.